The new issue of Nano Today (Volume 9, Issue 1) is out now. Click here to read the articles. Zinc oxide (ZnO) is a metal oxide material that exhibits unique semiconducting, piezoelectric, and pyroelectric properties. With a direct wide bandgap (3.37 eV) and a high exciton binding energy (60 meV) at room temperature, it has received significant attention in applications ranging from solar cells, chemical sensors, optoelectronic devices, piezoelectric transducers and actuators, and environmental photocatalysis [1-4]. Particularly for the latter application, and despite its unfavorable electrochemical properties, ZnO has become an efficient alternative for titanium dioxide, the benchmark photocatalyst [5-8]. Controlling the morphology is a very important challenge in the synthesis of inorganic materials since it greatly affects their properties and corresponding potential applications. ZnO is a very versatile material in terms of morphology. One- (wires, rods and tubes) two- (sheets and ribbons) or even three-dimensional (rings, bows, helices and springs) structures can be obtained by selecting the appropriate synthesis method and preparation conditions . Various routes including chemical vapor deposition, thermal evaporation, electrodeposition, solvothermal and hydrothermal methods have been reported for the preparation of ZnO materials with distinct morphologies at the micro/nanoscale . Amongst the different synthesis procedures, the hydrothermal route is attractive mainly because of its simplicity and environmentally friendly conditions . 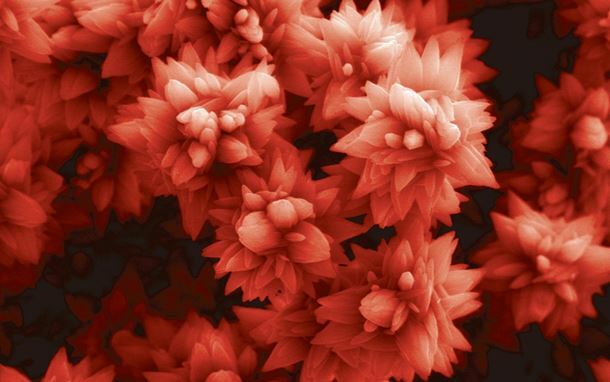 The cover image on Volume 9, Issue 1 of Nano Today shows flower-like ZnO structures produced through a hydrothermal procedure starting from an aqueous solution of zinc nitrate hexahydrate and hexamethylenetetramine. The mixture was thermally treated at 90 °C for 12 h in a Teflon-lined stainless steel autoclave after adjusting the pH to 10.0 using an ammonium solution. Finally, the obtained material was thoroughly washed with deionized water, in order to eliminate residual salts, and dried at 60 °C under vacuum. The ZnO bundles strongly resemble natural flowers. A single “flower” consists of needle-like crystals (“petals”) radiating from the center. The micrograph was made using a high resolution (Schottky) environmental scanning electron microscope with X-ray microanalysis and electron backscattered diffraction analysis (Quanta 400 FEG ESEM/EDAX Genesis X4M; secondary electron detector, 20 000´, 15.00 kV) at the Materials Centre of the University of Porto (CEMUP), Portugal. The material was synthesized at Laboratory of Catalysis and Materials (LCM), Associate Laboratory LSRE-LCM, Faculty of Engineering, University of Porto (Portugal). It resulted from an ongoing joint collaboration between LCM and the Institute of Physics of the Federal University of Rio Grande do Sul (Brazil), on the effect of the synthesis route in the morphology, optical properties and photocatalytic activity of ZnO materials. The ZnO materials produced are being used (ongoing work) as catalysts for two specific applications: the removal of organic pollutants from wastewater and hydrogen production from biomass compounds. Acknowledgments: The authors acknowledge Project PEst-C/EQB/LA0020/2013, financed by FEDER through COMPETE - Programa Operacional Factores de Competitividade, and by FCT - Fundação para a Ciência e a Tecnologia, and co-financed by QREN, ON2 and FEDER (Project NORTE-07-0124-FEDER-0000015). FCT is acknowledged for funding the Post-Doctoral grant SFRH/BPD/48777/2008. Dr. Carlos M. Sá (CEMUP) is acknowledged for assistance with SEM/EDS analyses. Support by Brazilian agencies CNPq and CAPES is also acknowledged. Further reading:  A. Janotti, C.G. van de Walle, Rep. Prog. Phys. 2009, 72, 126501;  A. Moezzi, A.M. McDonagh, M.B. Cortie, Chem. Eng. J. 2012, 185-186, 1;  S.A.C. Carabineiro, B.F. Machado, R.R. Bacsa, P. Serp, G. Dražic, J.L. Faria, J.L. Figueiredo, J. Catal. 2010, 273, 191;  S.A.C. Carabineiro, B.F. Machado, G. Dražic, R.R. Bacsa, P. Serp, J.L. Figueiredo, J.L. Faria, Stud. Surf. Sci. Catal. 2010, 175, 629;  M.D. Hernández-Alonso, F. Fresno, S. Suárez, J.M. Coronado, Energy Environ. Sci. 2009, 2, 1231;  C. Martínez, M. Canle L., M.I. Fernández, J.A. Santaballa, J.L. Faria, Appl. Catal. B 2011, 102, 563;  C.G. Silva, J.L. Faria, J. Mol. Catal. A 2009, 305, 147;  C.G. Silva, J. Monteiro, R.R.N. Marques, A.M.T. Silva, C. Martínez, M. Canle L., J.L. Faria, Photochem. Photobiol. Sci. 2013, 12, 638;  Y. Wang, X. Li, N. Wang, X. Quan, Y. Chen, Sep. Purif. Technol. 2008, 62, 727;  M. Vaseem, A. Umar, Y.-B. Hahn in ZnO Nanoparticles: Growth, Properties, and Applications, 2010, 1–36;  S. Baruah, J. Dutta, Sci. Technol. Adv. Mater. 2009,10, 013001. A novel leaf-shaped catalyst made from molybdenum disulfide could replace expensive platinum catalysts in hydrogen fuel cells.